If you loved Meghan Markle’s evening Stella McCartney gown, with halter neck, simple lines and fishtail shape, this dress is for you. 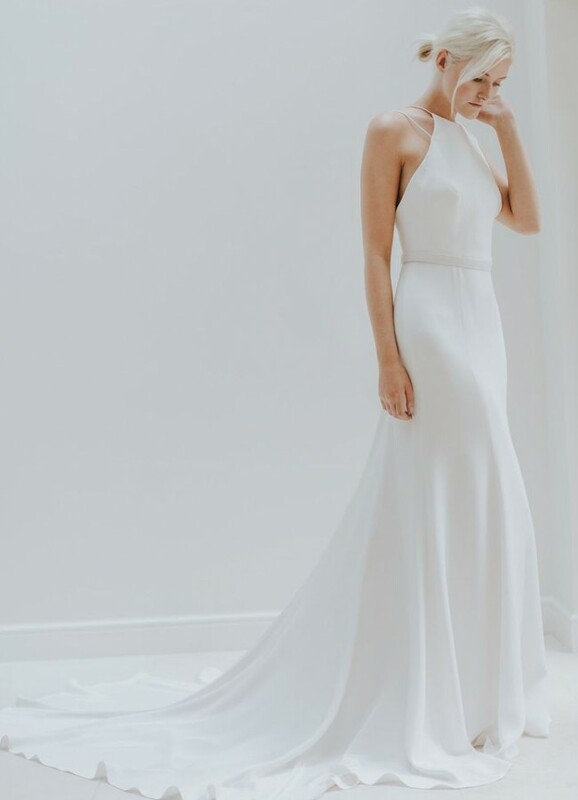 An understated, modern, elegant Charlotte Simpson gown made from luxurious silk crepe fabric, with an amazing train and beautiful button detailing on the back. Belt features cross hatch embroidery and is not attached to the dress. Halter neck floor length dress with double spaghetti straps and open back. 100% silk super weight crepe. Light Ivory. UK size 12. Never worn. 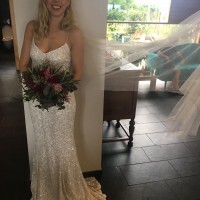 Charlotte is currently on maternity leave and not taking bespoke commissions, making her dresses incredibly sought after. Established in 2014, Charlotte Simpson bridal specialises in tailored minimalist design, clean, sharp lines accented with intricate hand embroidery. Charlotte graduated with an MA in Fashion Design and Technology, Womenswear from the London College of Fashion. Representing the best of British luxury and craftsmanship, Charlotte’s dresses use the highest quality silks and satins sourced from around the world. Once you send a message, Sabina can invite you to purchase the dress.